You can roll them, squish them, hug them, squeeze them, twist them, snug them, and mush them flat... just be sure to play nice because Sockdollies have fragile feelings. Sockdollies are made to be loved by anyone, but do have small parts, and should not be given to any children or pets who might accidentally eat them. 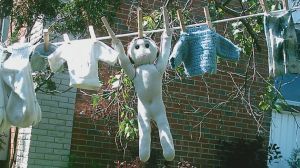 Sockdollies are Hand Wash and Air-dry only...they have issues with the washer and dryer. We recommend a gentle swish in warm water and Woolite, squeeze gently and lay flat to dry. Line drying is fun, but the neighbors might be concerned.